When we’re out adventuring, we often find ourselves asking the question “Are we old people?” It’s usually to do with the company we keep, but I don’t see it as a bad thing. “Old people” are usually past the “have to” part of their lives and in the “get to” part that’s so much better. Although, we do enjoy early dinners and I like to complain about the noisy kids on my lawn, even though I don’t have a lawn anymore. We had a free day in our Cairns schedule and decided to book a half-day tour of the city. Of the 16 or so folks on the tour bus, we were by far the youngest and two of three identified by the driver as “those of you who use Facebook.” Nonetheless, we made some new friends and had an amazing day. 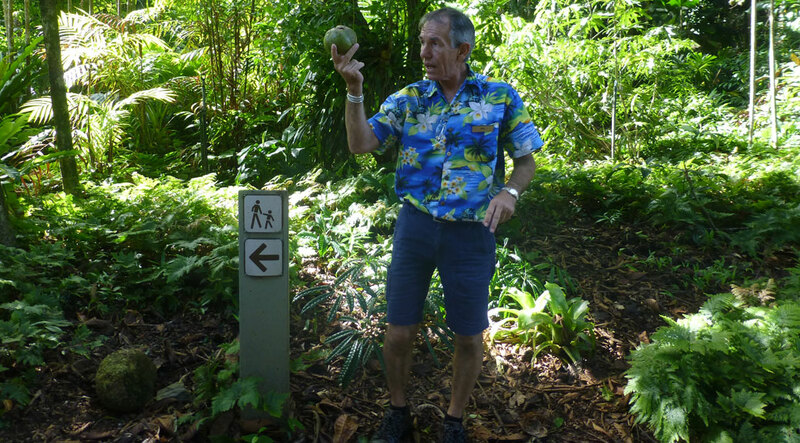 Our driver/guide, Eric, has lived in Cairns for nearly 30 years and was a wealth of information about the city’s history. He filled the time between stops with stories and visuals of local legends, such as the draw for big-game fishing in the 1970s that brought the likes of Lee Marvin and John Wayne to the then-sleepy port town. One of the visuals was a preserved cane toad in a jar that was brought in to clear out the beetles that were eating the sugar cane, but instead just multiplied and took over the town. Fans of The Simpsons will remember this story from the “Bart vs. Australia” episode. We started our tour by winding our way through the streets of downtown Cairns. The city has a long and interesting history. It was founded during the Australian gold rush in the late 1800s, but was nearly abandoned 20 years later after the gold dried up. It wasn’t until Japanese developers started buying up land in the 1980s that present-day Cairns began to take shape. The great thing about these tours is that you get to see things that you’d never discover on your own. About 15 minutes into the tour, we pulled into St. Monica’s Cathedral, the Catholic church in Cairns. From the outside, it’s a fairly plain building, but inside is one of the world’s largest themed stained glass displays. 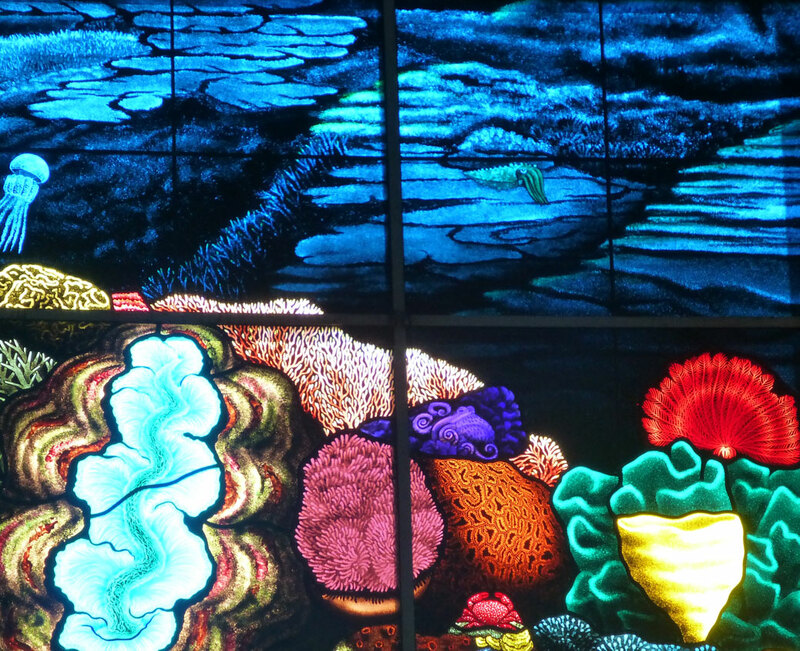 The work took nearly seven years to complete and is a modern take on creationism of Australia’s northeast coast. The colors were magnificent in the midday sun. After winding through a bit more of the downtown area, including the newly refurbished hospital and the local cemetery (remember, this is an “old people” tour and apparently old people enjoy these things), we stopped at Café 88. If we’re being honest, this stop was one of the reasons we booked this particular tour. 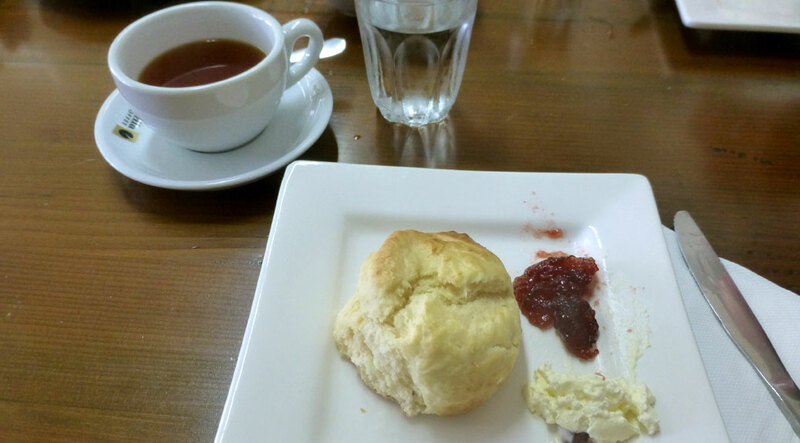 We were treated to tea, coffee and authentic scones with jam and cream. In ‘Merica, we’d call these scones “biscuits,” but whatever… they were awesome! We sat with a couple from Western Australia and another from Adelaide. Full on scones, we headed to the Cairns Botanic Gardens to walk it off. Tour guide Eric takes his job seriously and had clearly boned up on his garden knowledge, walking us through the planted side of the garden and explaining what we were looking at along the way. 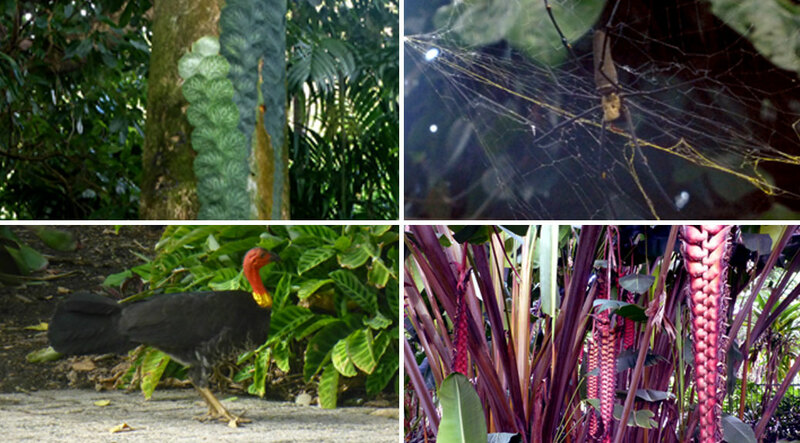 The Botanic Gardens are a mix of both regional and international plants with a little local wildlife mixed in. Early on, we saw a brush turkey’s giant nest and later on saw said brush turkey trying to liberate a tourist’s lunch. We learned the local names for plants, like the tattoo plant, which plastered itself against a nearby tree, or the rain tree whose resident bugs have a knack for expelling drops of water on unsuspecting onlookers. 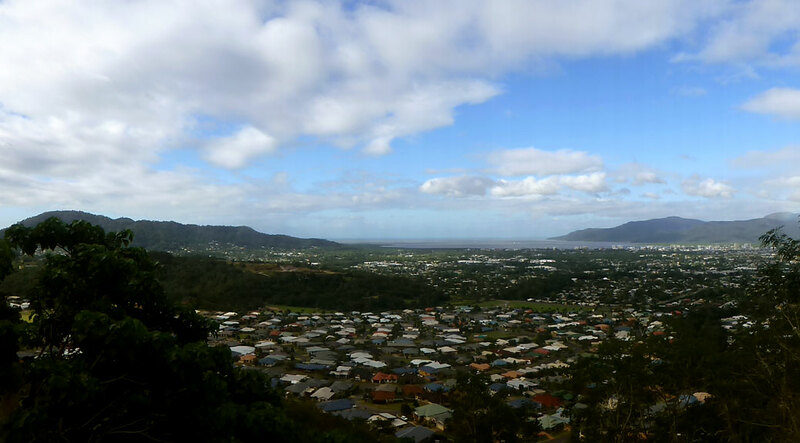 The next stop was purely for photos as we headed to the edge of a hill overlooking Cairns. 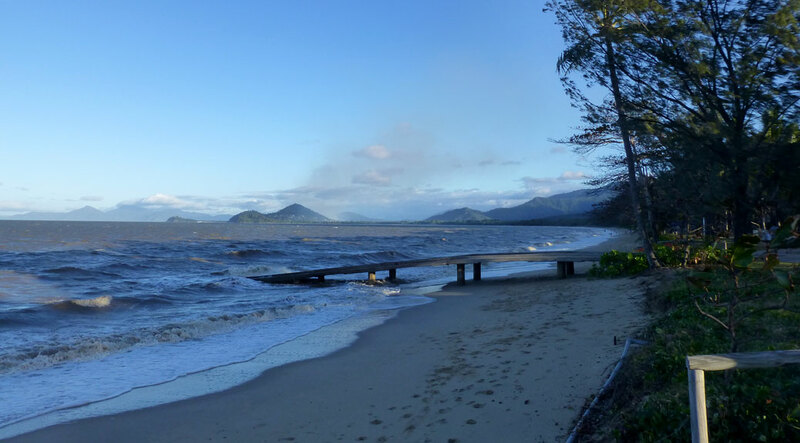 From here, we could see modern day Cairns as well as the trails formerly used by the cane sugar farmers and the dried riverbed that ran through prehistoric Cairns. Looking down Barron Gorge from the bridge over the dam. The sand bank on the left was washed in from the overflow caused by Cyclone Nargis in 2008. Back aboard the bus, we headed for Barron Gorge. 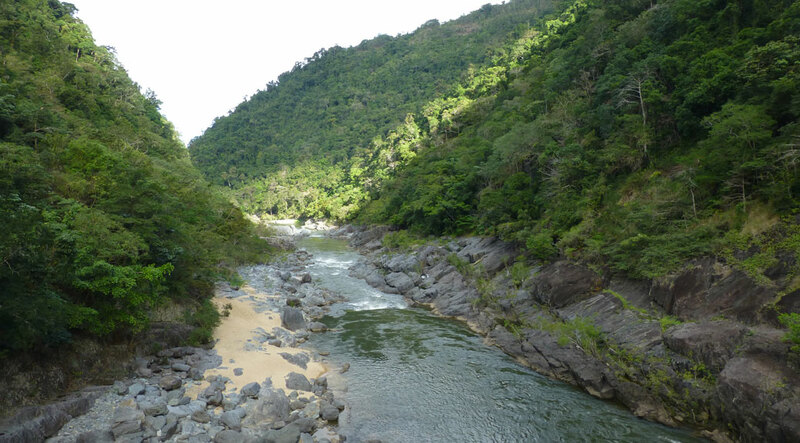 The Kuranda railroad line runs alongside the gorge and was built entirely by hand in the early 1900s. The BYOS (bring your own shovel) operation was a major source of jobs during the era. 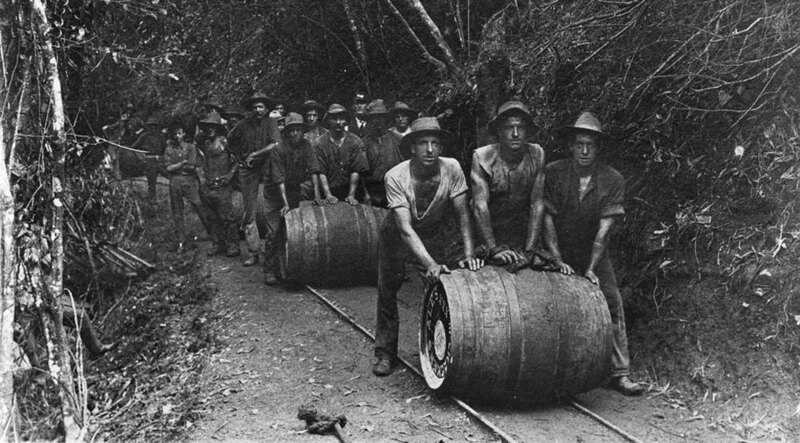 The workers also discovered a way to lug their beer kegs to the work sites from Cairns, taking turns rolling the kegs up the previously completed tracks. We finished our day in Palm Cove, one of the picturesque northern beaches, before making the hour-long trip back into Cairns. This would have been an ideal tour for our first day in town as we saw several sights that we wished we could have gone back to see, including the gondolas riding over the treetops into the tablelands. Regardless, I’m glad to have had the opportunity to get a taste of the real Cairns.